The park offers a great, off-the-beaten-path experience. From about mid-March through October, bats emerge nightly from Stuart Bat Cave. The viewing platform is fully wheelchair accessible, with a sloped cement path from the parking area to the observation deck. Full hookup campsites 1, 3, 5, and 7 are wheelchair accessible, with cement paths from the parking area to the sites and the bathrooms. Two of the five campsites (17 and 19) in the group camp are wheelchair accessible, with cement paths from the parking area to the sites. To get to the bathrooms from the group camp, you will need to travel about 0.25 miles on the lightly used park road. 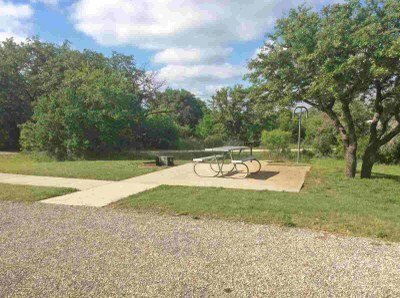 The park also has day-use picnic sites that are wheelchair accessible. A 2.4-mile segment of the Long Way Home Trail is along the lightly used main park road; it is paved, with some loose rock. The rest of the park trails are in a natural state and not considered wheelchair accessible.